I hope that later versions of Font Creator or MainType will offer some kind of Panose Wizard to make the process semi-automatic. It would be fantastic if one could add Panose info to a font just by selecting check boxes on dialogue boxes with illustrations of the different font characteristics. Would it be possible to include icons to the Panose dropdown boxes? What is the maximum pixel size? I could generate at least some of the images. Great idea. What about this? A problem that I see with this idea is that it is not just Latin Text. If you add fourteen bitmaps to the dialogue for Latin Text, then you also need eight for Latin Hand-Written Tool Kind, four for Latin Decorative Class, and eleven for Latin Symbol Kind. I think that icons would be too small to be very useful to anyone not already familiar with the classification system. I wonder if a Panose Classification Wizard would be a better way to implement this? It would be less distracting for those who do know the classification system and just want to pick from a simple drop list as it is now. I like Erwin's idea. It is less confusing than mine. If I have trouble remembering what "finial," "hiprad" and "SerProp" mean, what chance does a Newbie have? All solutions presented in this thread so far are all major improvements. I prefer to enhance this feature with as less effort as possible for two reasons. The PANOSE Classification Numbers are already explained in great detail elsewhere on the forum (see PANOSE your fonts). The time put into this enhancement will delay other feature request. Don't get me wrong, I believe every font designer should at least put some effort into getting correct PANOSE information. That said, I'm not sure what solution I prefer right now, as they both could be implemented in a short period of time. Another question is How far to carry it? I think the first three digits are a given. Beyond that it could get hectic. Dave Crosby wrote: You are the BOSS! I try to see myself as an independent innovator. No matter what way it goes, first improvements will be basic. So yes, the first three digits might be a good start. After using the "measure" tool to get measurements to plug into the spreadsheet I created that generates PANOSE strings that can be pasted into the font information dialog, I think it wouldn't be overly difficult to provide a wizard that would make the measurements even easier, and then display a report that can be copied and pasted into such a spreadsheet. So, to be clear, I don't want FontCreator to be able to do everything, just help with the measuring. A lot of the measurements require me to zoom in for accuracy, then read the info off the measure box (sometimes not the full measure, but instead the horizontal or vertical component). But, if the functionality of the "cut contours " tool was combined with the "measure" for this wizard, it would allow measurements to be done at normal zoom, with the two endpoints of the "cut" being used for the length. There are only 13 glyphs that need to be measured in a Latin Text font to get complete PANOSE information. A wizard could present each glyph, then step through the measurements for that glyph, and the user could draw the lines. Other advantages of a wizard would allow some of the more complex "tangent" measurements (like OutMid and InMid on the uppercase O) to be done with a simple line draw that indicates the angle, plus the wizard could constrain the start point on some measurements (like the ones that must always start from the center of the glyph, or must match the italic angle set int the font properties). Even a wizard that only did the "easy" but often incorrectly set PANOSE features (weight, proportion, and contrast), which require only 15 total measurements on 6 glyphs would be a great help. With a wizard like this, I could probably get correct PANOSE for 20 fonts an hour, instead of the 5 or so I can do now. 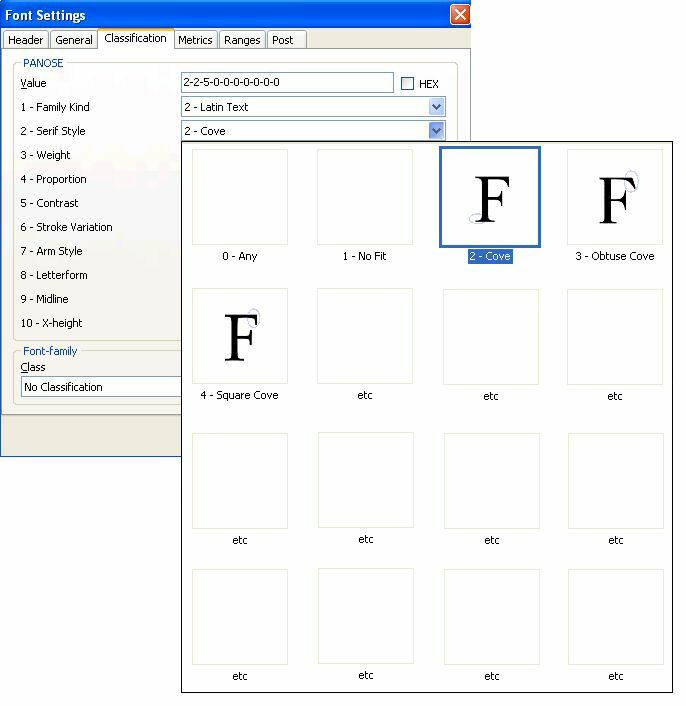 I know this would be a really low-priority enhancement, but I don't think any such tool exists anywhere, so it would lift FontCreator even farther into the "professional" arena. Just automating the measurements needed to determine the Panose numbers would be a great help.